If you’ve got a shiny new phone this holiday season, the chance that it was an iPhone is double the that of it carrying Samsung's branding. Flurry Analytics, an insight company for Yahoo! has found that 44% of activated devices between December 18 and 25 were iPhones (down 5% from the same report in 2015). 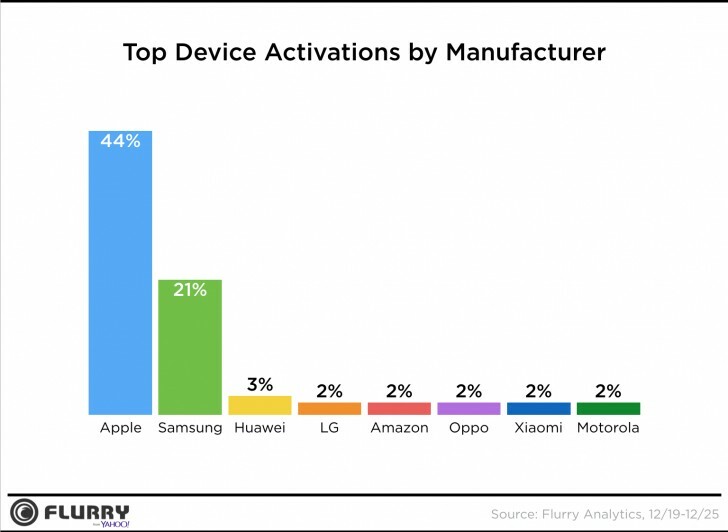 Meanwhile, just 21% of devices activated were made by Samsung (up 2% from last year’s report) and Huawei devices made it to the third slot with just 3% (Huawei did not even show up in last year’s report, way to go Huawei!). Apple does have an advantage during the Holiday season as many iPhone owners have probably waited until the holidays to make the upgrade. Otherwise, Samsung’s Galaxy S7 and Galaxy S7 edge are already well into their product cycle, even so, it earned the number 2 spot of smartphones activated during the holidays. Likewise, the number includes both smartphones and tablets activated during the period, so keep that in mind. The same report says that phablets are on the rise (a phablet, here, is [arguably] anything between 5 and 6.9 inches). In fact, this category of smartphones has steadily increased even holiday season with each passing year, though if the category started at another screen size, I’m sure we’d see different market shares for phablets and medium-sized numbers. 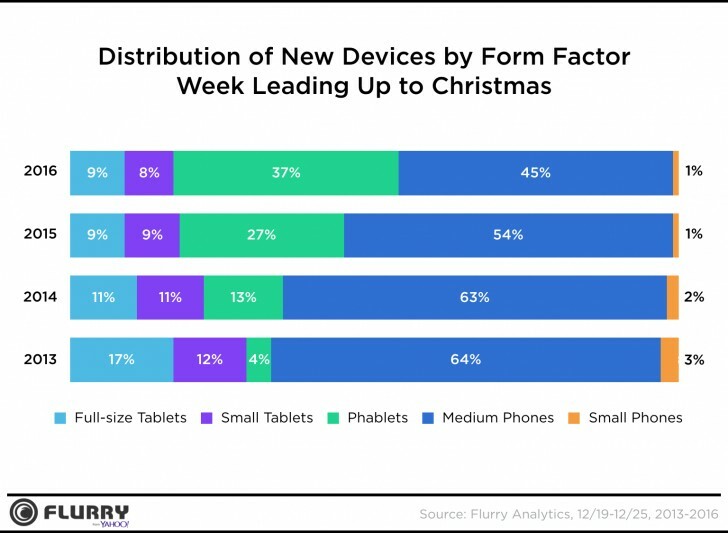 Like the last statistic, the share of devices by screen size also represents the week leading up to Christmas, December 19 through the 25. On the theme of Christmas, many choose iTunes or Google Play giftcards as holiday favors, making Christmas Day the biggest day for app downloads, according to the analytics company. In fact, the company tracked as much as two times the number of app installs than on an average day in December. The report doesn’t specify whether the app downloads are paid or not, but for this report, we’ll just assume the apps represent paid apps. Do we really need to go into market segmentation and business goals with you? The world is more complicated than you think.